Manufacturing activity in Indonesia continued to expand in November 2018. However, the pace of expansion slowed further, for the third straight month, and the November reading was in fact the lowest reading of the past five months. Based on the latest Nikkei Indonesia Manufacturing Purchasing Managers' Index (abbreviated as PMI), manufacturing activity in Indonesia dropped from 50.5 in October 2018 to a reading of 50.4 in November 2018 (a reading above 50 indicates expansion in the country’s manufacturing sector, while one below 50 points at contraction). 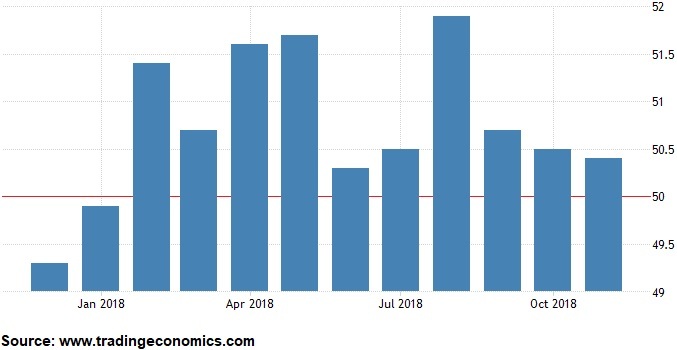 It is worrying to see three consecutive months of slowing manufacturing activity in the largest economy of Southeast Asia - even though, for now, the figure remained above the boom-bust breaking point. However, being close above this breaking point implies that improvement in the nation’s manufacturing activity is only marginal. The headline Nikkei Indonesia Manufacturing PMI provides a snapshot of the manufacturing performance, deriving its conclusions and information from questions on output, new orders, employment, inventories and delivery times that are asked to stakeholders in the manufacturing industry. The text above is the introduction to the article that is included in the November 2018 edition of our research report.